Please Note: This post was published in August 2015 and may not contain current information. 1. Where is the Dallas Immigration Court? 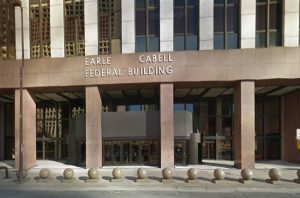 The Dallas Immigration Court is located in downtown Dallas on the 10th floor of the Earle Cabell Federal Building. The address is: 1100 Commerce Street, Suite 1060, Dallas, TX 75242. Enter the building through the doors facing Commerce Street and go through security. There are two sets of elevators in the lobby. Go to the elevators on the right after clearing security. The Dallas immigration court is not particularly well marked, so when you get to the 10th floor, look for signs to Suite 1060, or ask someone in the hallway for directions. 4. What does the court do? The Dallas Immigration court hears cases to decide whether an immigrant can stay in the United States or must be deported. You can represent yourself or hire a lawyer. It is usually not a good idea to represent yourself. View the Top 5 Reasons to Hire an Immigration Lawyer. The immigration judges do not care if traffic is bad. One immigration judge recently said “You know how you fix that? Leave earlier.” If they can get there on time, so can you. There is no special parking for immigration court, so you will have to park somewhere in downtown Dallas. Since there is limited parking in downtown, make sure to arrive early. There is a large parking lot one block west of the Earl Cabell federal building, next to McDonalds. There is also a fair amount of metered parking in downtown Dallas. If you are going to park at a meter, you should probably bring someone with you to court so they can go downstairs to feed the meter if your case takes longer than expected. 6. How long will my court hearing take? Be respectful to everyone you meet at the court. Being a jerk is never helpful. Being a jerk to an immigration judge is just stupid. Even while you are on the elevators, in the lobby, or in the bathroom – be respectful to everyone. The person next to you might well be your immigration judge or one of the government’s attorneys. Shhhh…..Everything that happens in immigration court is being digitally recorded. Be very quiet when you are in court. Also, make SURE your cell phone is turned off. The immigration judge does not think your ring tone is cool. The court does not allow food or drink in the courtrooms. Gum is food. There is no quicker way to earn an immigration judge’s wrath than to chew gum in court. Be smart: Spit gum out before entering the courtroom.